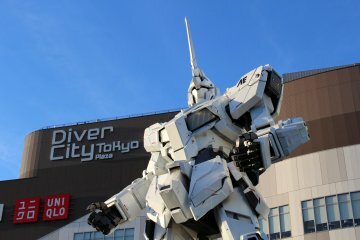 Do you know where the most popular place for tourists to take a souvenir photos in Japan is? 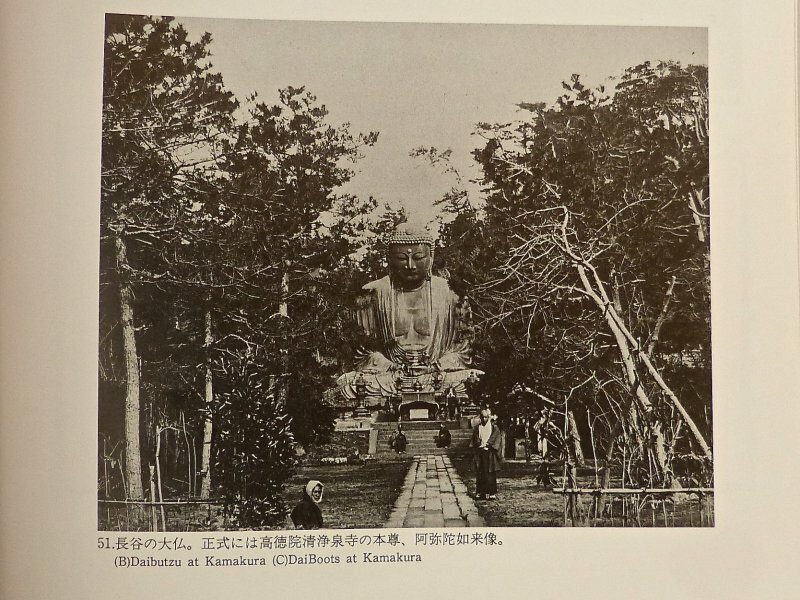 And do you know what the first statue photographed and introduced to foreign travelers in Japan was? 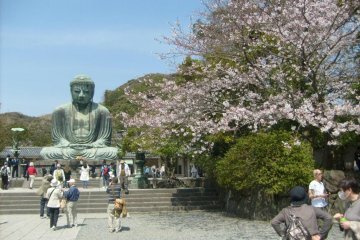 The answer to both questions is the same: Kamakura’s Daibutsu! 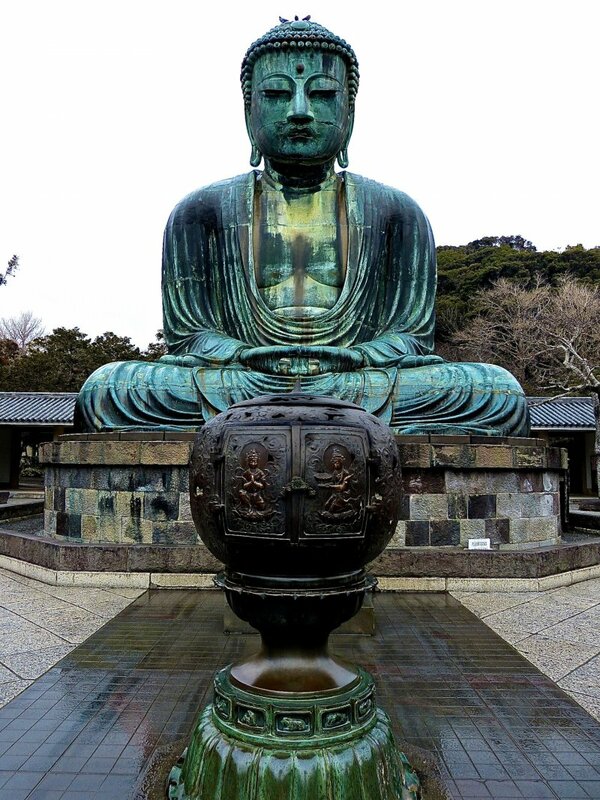 Kamakura’s Daibutsu is a beautiful bronze statue built in the mid 13th century (750 years ago). He has been meditating under the sky for about 500 years of those years, after losing the shelter he was originally housed in. When you visit, you might see him soaked in rain, or sweating under the glaring sun, or just enjoying the warm spring sunshine. Whenever you come, his expressive face will touch your heart. 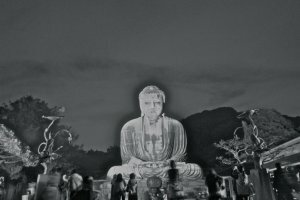 Kamakura’s Daibutsu has been kept intact, without any large-scale restorations since it was built, while most parts of Nara’s Daibutsu has had to be reconstructed. 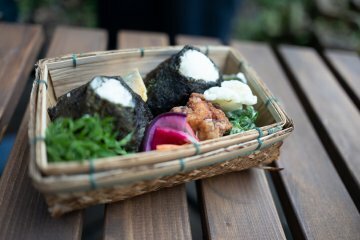 Starting in the early 13th century, the Kamakura Shogunate began to regulate the city’s institutions and facilities. 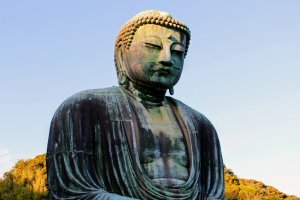 Buddhism ruled the country in that day and age, so they first built temples at the north, south, east and west corners of Kamakura city to receive the protection of the Buddhism. And then, they thought they needed a symbol of the newly established capital. This was Daibutsu. 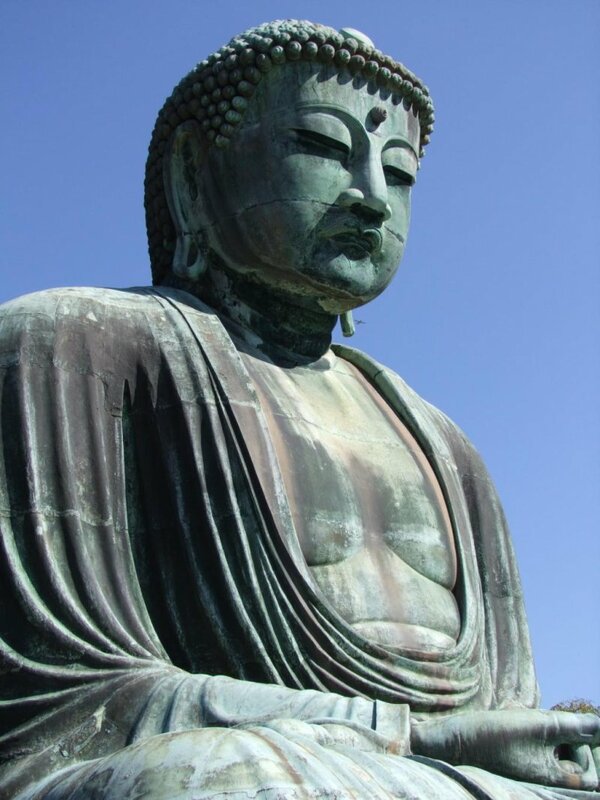 According to the official record of Kamakura Shogunate “Azuma Kagami”『吾妻鏡』, the construction of the first Daibutsu was begun in 1238 and the ceremony to cerebrate the completion was held in 1243. It was made of wood. But in 1252, the casting for a second Daibutsu was started. 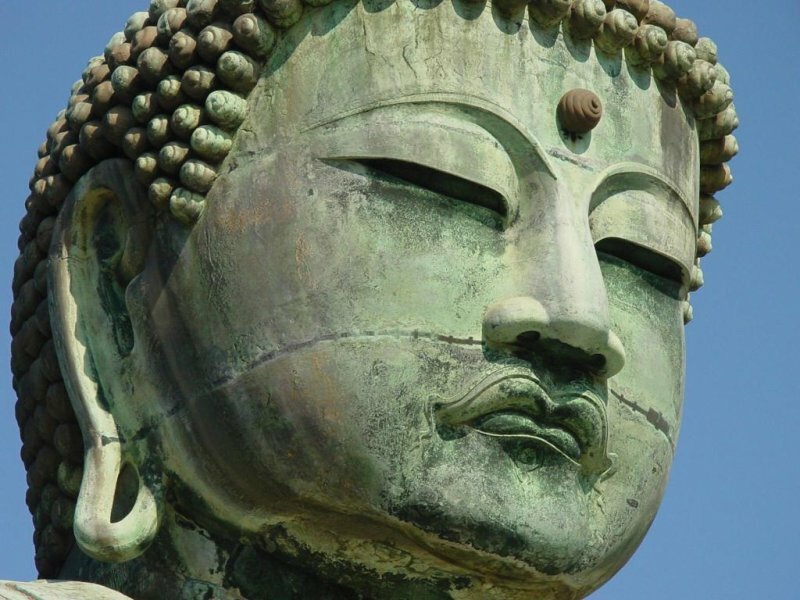 And this means that the second Daibutsu is almost 760 years old! Now, I will give you some additional information about the statue itself. 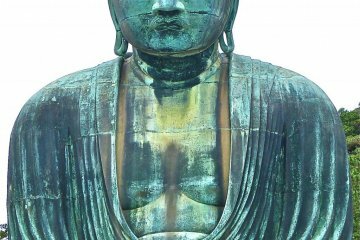 Can you see the fragment of gold leaf on Daibutsu’s right cheek? The original Daibutsu was covered in gold over his entire body. 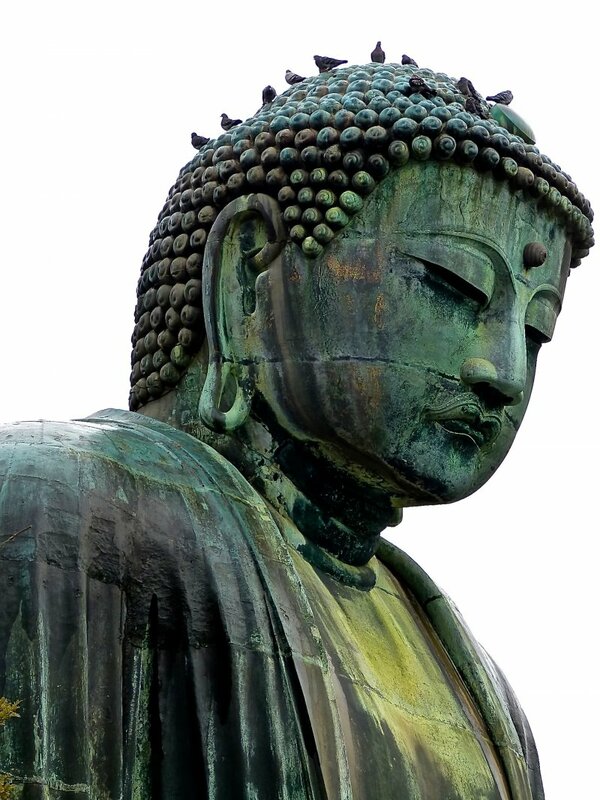 Nara’s Daibutsu (made of copper) was plated with gold. 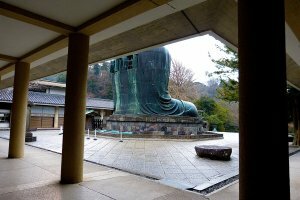 But Kamakura’s Daibutsu was made of bronze (68.7% copper, 9.3% tin, 19.6% lead) and so it was impossible to plate using the techniques of the era. Instead, they attached gold leaves to the body. About the eye, the length between the inner and outer corner of the eye is about one meter. The ears are 1.95 meters tall with big earring holes (Siddhartha pierced his ears before he left home!). And can you see something below His nose? Yes. Daibutsu has a mustache! The statue is 11.387 meters in height. 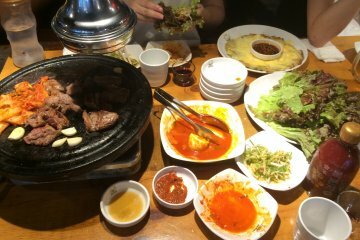 It was created step by step, in more than ten incremental pouring, starting from the bottom and moving up to the head. You can see the linear borders of each pouring like patch work all over the statue’s body (resembling the rings of a tree). 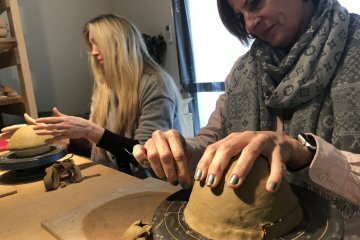 There are hundreds of joints inside, which connect the bronze pieces to one another securely. You might also notice the several stones scattered around the statue. The surface of these stones is flat. They are thought to be the foundation stones of a building that once housed Daibutsu (Daibutsu-den). 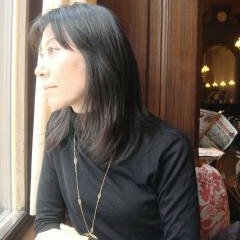 That building was destroyed and rebuilt, before they finally decided to leave Daibutsu outside under the moon and the sun. 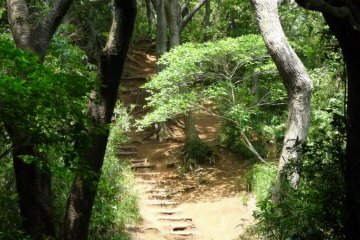 We can see the records about Daibutsu-den’s reconstruction in 1335 (Taihe-ki『太平記』) and in 1369 (Kamakura Dai-nikki 『鎌倉大日記』). 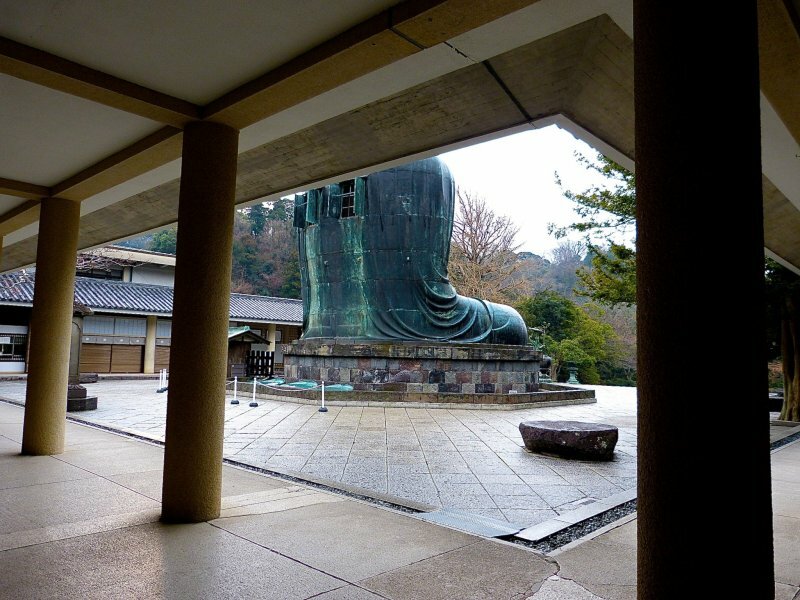 And “Baika Mujinzo” 『梅花無尽蔵』says that Daibutsu was unsheltered in 1486. So, most scholars believe that Daibutsu-den has been lost since 1369. 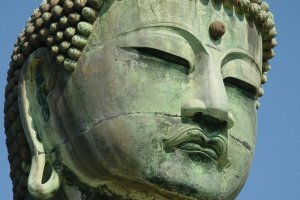 Some people believe that a tsunami in 1498 destroyed the house of Daibutsu, but no evidence was found from the excavation research in 2000 to show that there was any reconstruction of the building after 1369. 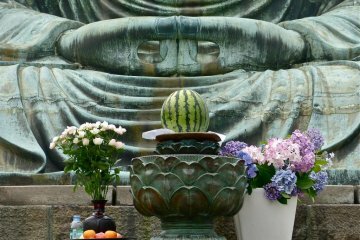 Here’s an interesting story: About 40 years ago, one family from the United States came to Kamakura to see Daibutsu. 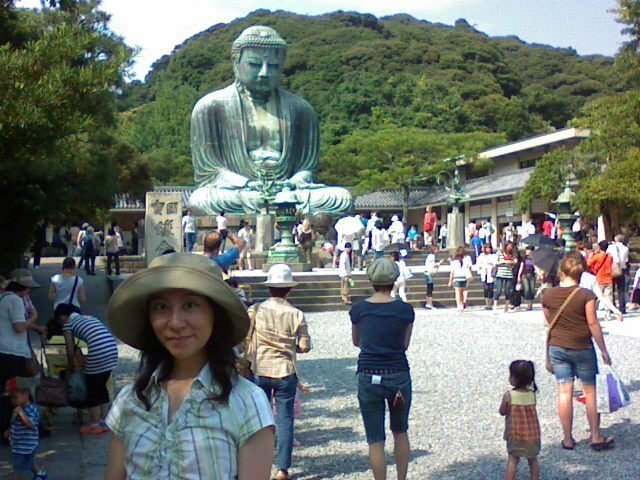 At that time, the kid of the family could not appreciate the statue, even though his parents admired Daibutsu deeply. The only thing that the kid was interested in was the green tea ice cream sold nearby. 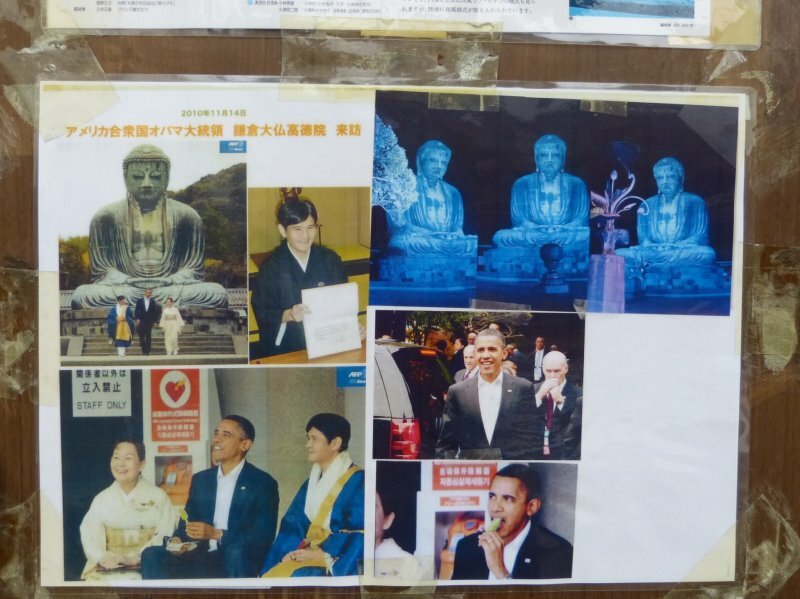 Many years later, when the APEC conference was held in Yokohama in 2010, representatives from countries all over the world came to Kanagawa and after the meeting, one of them was eager to visit Daibutsu. 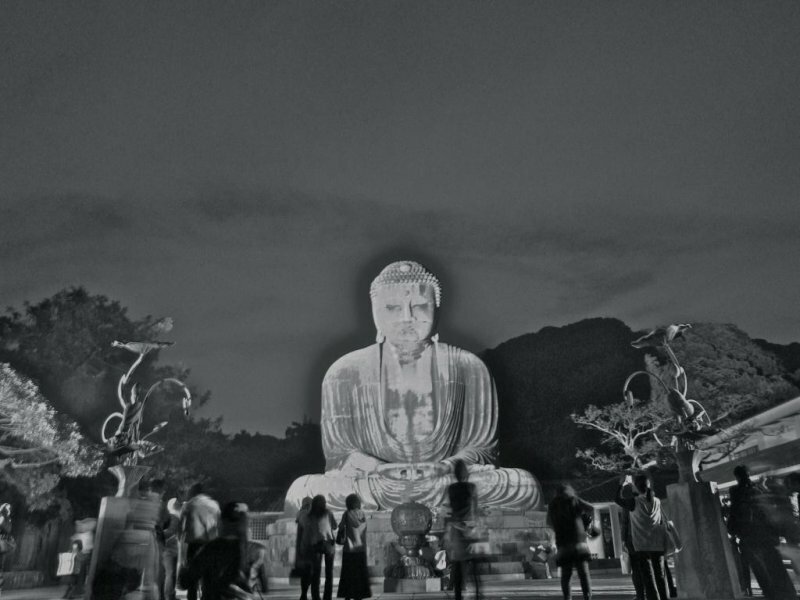 He wanted to see Daibutsu again and feel the real Daibutsu for the first time. He was the same kid who came to Daibutsu 40 years ago with his family and enjoyed the ice cream. His name was, as you might have guessed, President Barak Obama. 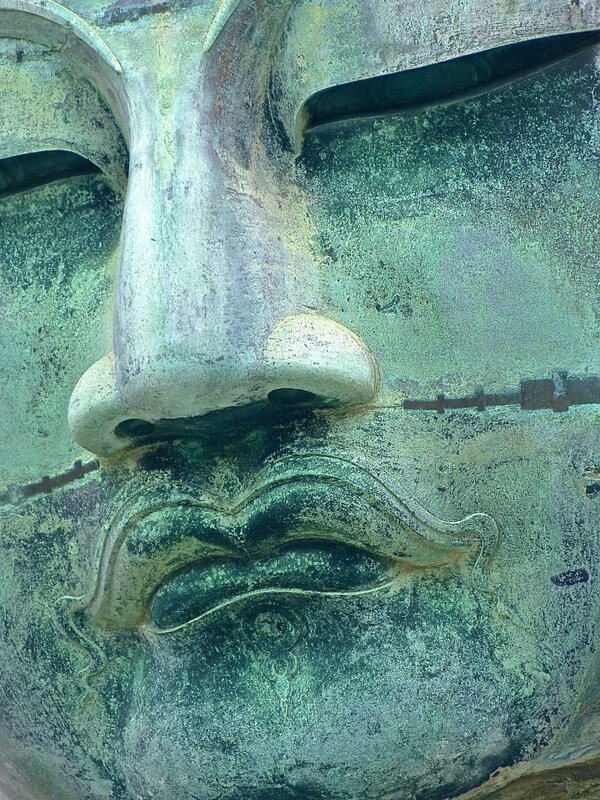 I think the charm of Kamakura’s Daibutsu is in his expressions. The color of the surface and the circumstances around the statue has changed over the centuries. 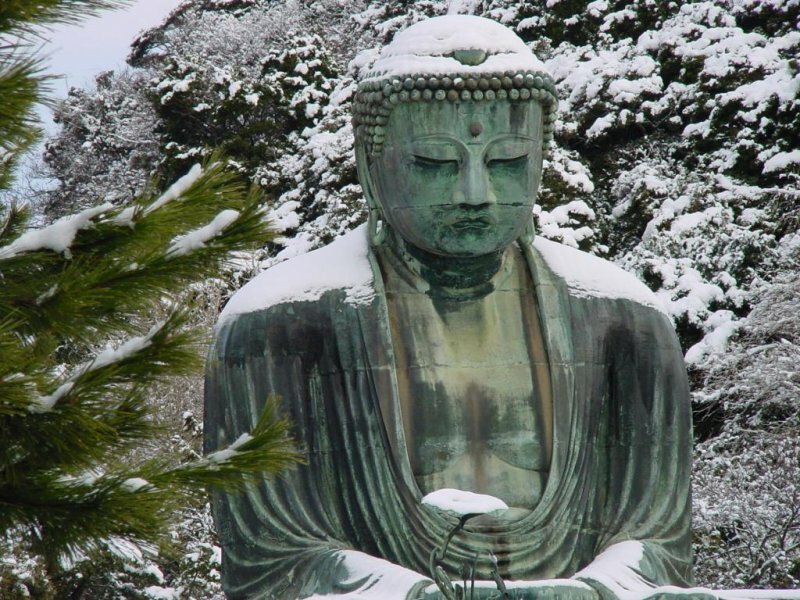 But Daibutsu consistently shows us his depth in his countenance. 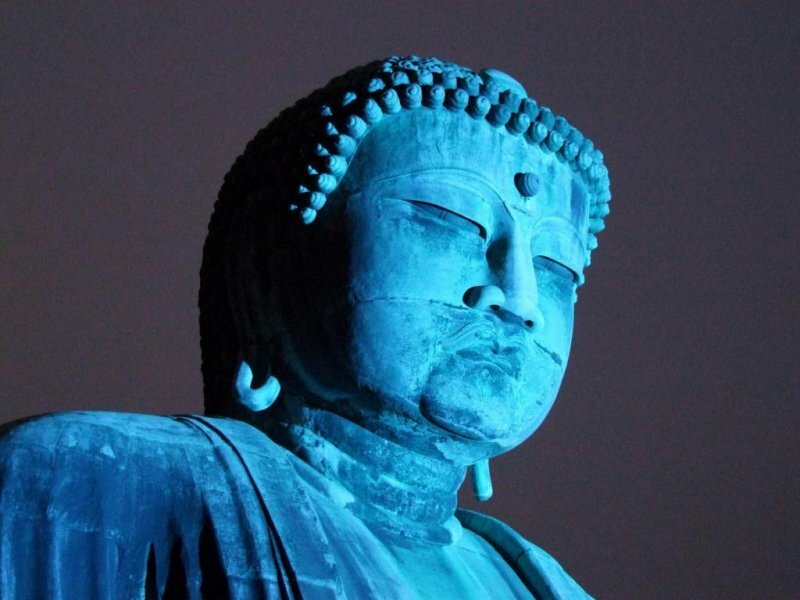 By the way, as a part of World Diabetic Day events, the temple often holds a blue-tinted “Daibutsu Light-up” in mid November. Please see the details here. 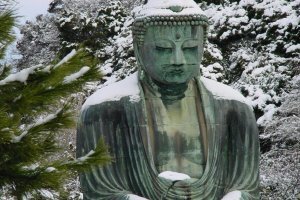 Next, please read about how Daibutsu was built and what is expressed in Daibutsu’s figure, in the following two articles. This is one of the man made wonders of Japan, and what a great story behind it. 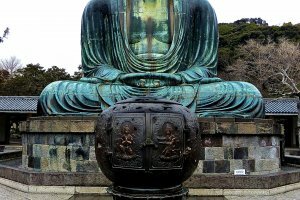 The Kamakura Daibutsu is a MUST SEE. And the city is especially beautiful during cherry blossom season.